The weather forecast promised snow, but we decided to trek to New Jersey anyway. My Dining Partner (MDP) and I were dead set on delivering a brand new TV to my mom, a week before the Super Bowl, snow be damned. The TV was meant to be a gift for my mother’s birthday, which is in February, and we wanted to cap off the evening with a special dinner at The Red Cadillac, a Mexican restaurant located on Morris Avenue. Situated among big box pharmacies and 7-11 outposts, The Red Cadillac features a genuine red cadillac out front. It’s no wonder the owner decided to park his car there; in the back, parking is spare. I pulled into the slosh-filled driveway and parked my car in what was probably a handicap spot, but the blanket of white and grey muck obscured the wheelchair figure that was certain to be painted on the macadam. “This okay here?” I shouted to someone who seemed to work there. “It’s valet parking, but that’s fine,” he said. And so we entered. A sign beckoning “no sports caps” welcomed us as we walked through the double doors of the entrance. Dim lighting washes the spacious interior and helpful hostesses greeted us and sat us at a table in the back. MDP observed that there were plenty more seats available at The Red Cadillac than parking spots behind the joint. We received plastic-covered menus on clipboards and proceeded to survey the options. A bucket of chips with chipotle-inflected salsa were brought to our table, along with some drinks. Honestly, the chips and salsa turned out to be the best part of the meal. 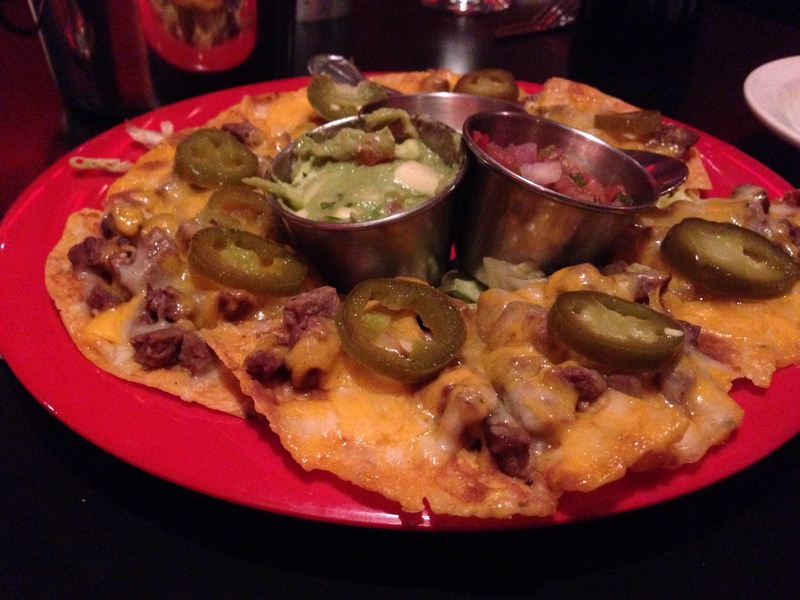 To begin, we ordered the Cadillac nachos, which come with bits of steak covered with monterey jack and cheddar cheeses. Tiny buckets of thickly chunked guacamole, sour cream and pico de gallo sat in the center of the plate. I took two bites of the nachos and declared them unsatisfactory. The steak tasted like sausage and seemed out of place. The melted cheeses were fine enough, but didn’t scream authentic or special to me. Though we polished off the plate, I’m not sure anyone was thoroughly impressed with the fare. For our entrees, I ordered the chicken fajitas, while my mom got the beef burrito and MDP tried the pork chimichanga, per the recommendation of the waitress. My chicken fajitas were spicy enough (as requested), yet the seasoning was too heavily applied. There was little nuance of spiciness in this dish; it was all or nothing. The flour tortillas that accompanied my fajitas were stiff and cold, lacking the warm suppleness found aplenty in decent Mexican establishments. My mom enjoyed the burrito, but when I took a bite, it felt reminiscent of the Ortega seasoning in the make-your-own-burrito box from the grocery store. MDP’s chimichanga was fine, yet the chunks of pork were drowning in what tasted like the chipotle salsa used for the chips and salsa on the table. I wasn’t pleased with anyone’s dish. When I received the bill, which I deemed too much for what we had (in terms of value; the prices were added up correctly), I was even more disappointed in the experience. 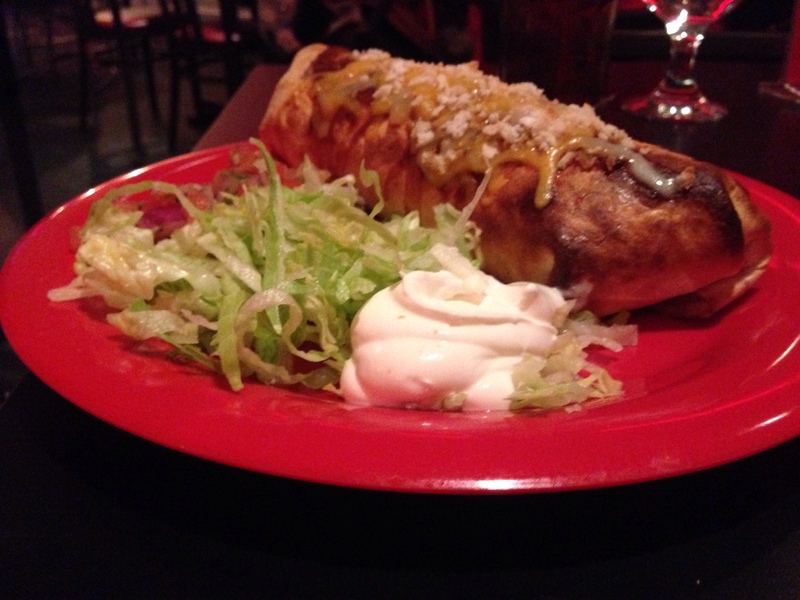 If you’re looking for good Mexican food, don’t look toward The Red Cadillac to satisfy your predilection. There’s got to be better Mexican food in New Jersey than this, so do some exploring. I found myself comparing The Red Cadillac to Dos Caminos and Rosa Mexicano, since TRC’s prices are nearly in the range of the high-end Mexican cuisine of those two restaurants. Without a doubt, the food isn’t nearly as good. If you know of a decent Mexican place in the suburbs, give me a shout in the comments. I’d love to try a new restaurant. just sum it up what I had written annd say, I’m thoroughly enjoying your blog. I as welkl am an aspiring blolg blogger but I’m still new to everything. Hello! Thank you for reading. I think that, for me, what works is writing about what I know and love. This usually lends itself to the most interesting subjects, and, subsequently, the most interesting writing. Good luck with your blogging endeavors!